Amongst the items of business discussed at the Battersea Borough Council meeting of 22nd September 1915 were Council prosecutions. These included two prosecutions for the management of brothels (one on Lavender Road and one on Middleton Road [now Buckmaster Road], see this post for how this sort of offence was handled), a prosecution for selling sausages mixed with boric acid and one for selling watered down milk. A look through the prosecutions brought by the Council in 1915 shows that the majority related to food and drink, and especially to the watering down of milk. In June alone four shopkeepers were prosecuted for it and of the 15 prosecutions brought since April 1915, 9 were for watering down milk, 2 for selling margarine wrongly labelled, 3 for brothel keeping and one for adulterated food – the sausages mentioned above. The standards for food, and especially milk, were a particular concern of the Council because of their impact on public health. 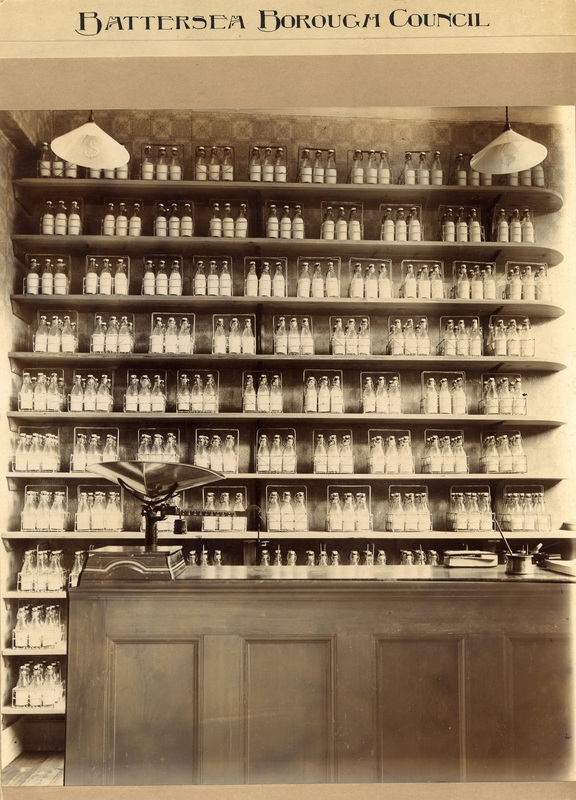 The Health Committee were responsible for the maintenance of the Council’s Milk Depot at 28 York Road, as well as for the prosecutions, and in the same meeting were reporting on the expenditure of the Depot. The Depot opened in June 1902, following the model of similar depots in France. The first such depot in the UK opened in 1899 in St Helens, followed by Liverpool, Ashton under Lyne and Dukinfield in 1901 and then Battersea, with others to follow. All the depots were municipal, run by local councils to deal with public health issues in their areas. The aim was to provide safe milk, which could be used for babies and young children when breast feeding was not possible – a 1910 publication on Infant Mortality, written by the former Medical Officer of Health for Battersea, was very clear that breast feeding was considered the best option for ensuring the good health of infants. Milk was bought from approved farms, mixed with water, cream, sugar and salt and then sterilised before it was issued in varying amounts depending on the age of the child in need of it. Older babies were given unmodified milk, which was also sterilised. The Battersea depot had a daily output of 1421 bottles for 211 customers in September 1915. A 1910 report on Infant Mortality (available here, via the Wellcome Library) showed that the mortality rate for infants using the Depot was lower than the mortality rate for the rest of the borough, this was referenced in the recommendation put to the Council above. The Depot was gone by the 1930s, but the Council’s responsibility for public health continued, the Heritage Service has photographs of the Borough milk inspector in the 1950s and the Council still have duties today.